Do you live in Chicago? Remember that storm last Friday? Did it just rain on the outside of your house while you watched netflix or were you upset that pitchfork or Pearl Jam got rained out? Well, for anyone and anything outside it was WILD. As much as we were grateful for the rain (its been a little dry since the wet start to the season), the blustering gusts of wind driving it into the ground ended with over 3/4 of our corn laying flat on the ground. Yeah we freaked out. Maybe a lot. So what? We had taken care of that stuff for weeks. 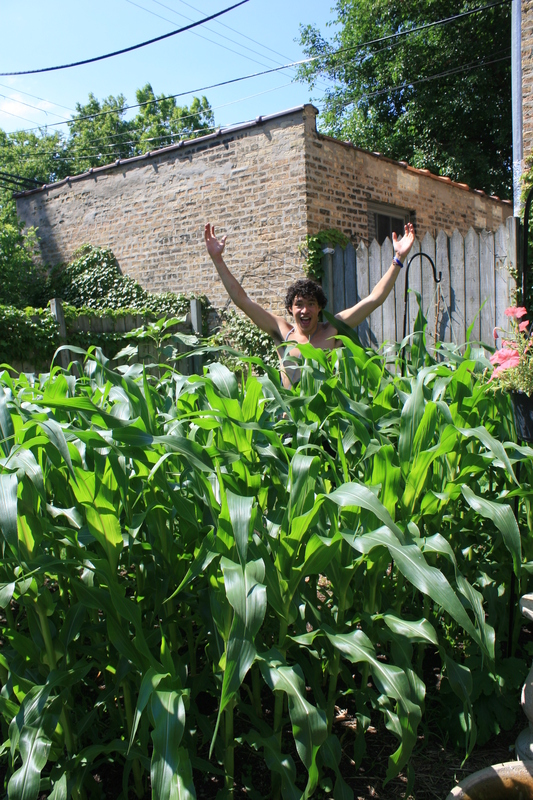 Watching it pass benchmarks like “knee high by 4th of July,” and growing taller than our shortest (and then tallest) team member made each gardener glow with pride when we caught a glimpse of the corn patch’s waving plumes reaching above the fence. Though their snapped stalks will never fully right themselves, their ears of corn grow nonetheless. I guess I should have known that if corn was killed every time a storm blew through there wouldn’t be any corn left in the world. Nature is powerful and beautiful, even when humans have commandeered it for their own productivity. These plants have taught me a lot about living my life. We can’t stop a storm. No matter how much we plan or how effective our preventative actions may or may not be, we have no choice but to look at what is in front of us and look to grow and improve. Corn doesn’t plan to fight back against the sky. Corn doesn’t give up and wither away. Corn doesn’t say “the city seems stacked against me, I should try to grow somewhere else.” Even after a storm, battered and laying upon the ground, what needs to be done is done in order to make tomorrow be better than today, every day. This entry was posted in Summer 2013, Yard Share Farm and tagged Climate Change, Corn, Crop Failure, Crop resilience, LETSGO Chicago, Yardsharing by letsgochicago. Bookmark the permalink.